A common refrain today is that manufacturers find it increasingly difficult to hire a qualified workforce. 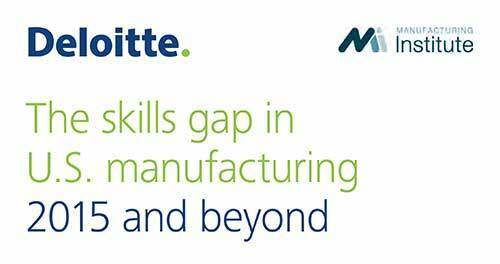 According to the latest skills gap report from Deloitte and the Manufacturing Institute, over the next decade, nearly 3.5 million manufacturing jobs likely need to be filled, but the skills gap is expected to result in 2 million of those jobs going unfilled. Factors contributing to this gap appear to include negative popular perceptions of manufacturing careers and an inadequate pipeline of STEM graduates. New York is no exception to this challenge, and FuzeHub and its partners frequently hear about how it is impacting Empire State manufacturers’ ability to grow and compete. “What can be done?” is often the question. This blog entry seeks to shine a spotlight on some of the things that ARE being done to address the manufacturing workforce shortage at various stages of the pipeline, in every corner of the state. These are efforts that companies and economic development organizations can plug into to help plug the skills gap and prepare for future growth. The SUNY community colleges have been busy boosting their manufacturing-related training programs. SUNY TEAM (SUNY Training and Education in Advanced Manufacturing) is nearing completion of a three-year undertaking funded by the federal Trade Adjustment Assistance Community College and Career Training (TAA-CCCT) program. SUNY reports that it has trained over 4,000 students for competitive careers in manufacturing since the fall of 2012. Through over 47 SUNY credit programs and numerous manufacturing targeted non-credit programs, all 30 SUNY community colleges have worked with over 150 businesses to revise, expand and enhance existing programs and build new programs including mechatronics, CNC machining, photovoltaics, p lastics, optics and welding. 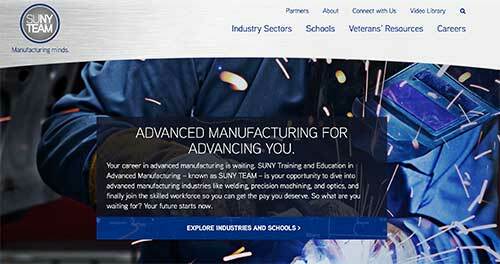 Manufacturers, students, and incumbent workers can now explore the interactive SUNY TEAM website to easily identify manufacturing training programs around the state, sorting by field. FuzeHub suggests that manufacturers use this tool to identify relevant programs near them and develop relationships with key college administrators and faculty, in order to position their companies to hire qualified graduates. The New York Manufacturing Extension Partnership (NY MEP) provides direct training to manufacturers, helping to keep employees’ skills current in everything from operations and efficiency to sales and adoption of new technologies. The 11 organizations that comprise NY MEP occupy an important role in the workforce issue, given that they are service providers to and advocates for manufacturers in their respective regions of New York and maintain partnerships with local training providers and economic development stakeholders. Most NY MEP centers, for example, assist in facilitation industry-education partnerships and are supportive of expanded apprenticeship and on-the-job training opportunities. Many are in regular dialogue with their local Workforce Investment Boards and community colleges and report to them on the skills gaps being experienced by the manufacturers they serve. • Hudson Valley Technology Development Center’s provides direct, on-site training of technology professionals and engineers. HVTDC performs this training under contract with clients who hire the trainees after an internship at HVTDC during which they work to solve a client problem. • The Center for Economic Growth, through its Workforce Development & Education Initiative, has facilitated business-education partners, promotes awareness of STEM and manufacturing careers, promoted Manufacturing Day plant tours, and served as a business intermediary for the region’s Workforce Investment Boards. • NextCorps plays an advisory role to the Finger Lakes Advanced Manufacturers’ Enterprise to promote job-driven, manufacturing-focused educational initiatives in schools. • Insyte Consulting is a participant in Western New York’s “Dream It! Do It!” campaign in conjunction with the National Association of Manufacturers. • Central New York TDO is a lead organization working on bringing a hands-on training center and program to Central New York to address the technician skills gap at the entry level. If you’re a manufacturer with a workforce challenge, submit a request to FuzeHub to seek assistance from this network. New York is fortunate to have this unique organization providing targeted workforce development solutions throughout the state. Among its programs are interactive grants through which regional WDI staff work directly with a business, union, or other organization to develop a tailored response to a particular workforce challenge. Manufacturing and energy are WDI’s biggest areas of focus, and it is highly flexible and streamlined in delivering assistance to companies. In 2013, Governor Cuomo initiated the New York State Pathways in Technology Early College High School program, ultimately creating 33 “P-TECH” schools. Students in these six-year programs undergo intensive project-based and workplace learning to prepare for high-skill jobs in technology, manufacturing and healthcare-related fields, ultimately earning a STEM-related associates’ degree at no cost and becoming first in line for jobs with partnering companies. It’s a project that truly re-imagines the pathway for students to become inspired by and prepare for 21st century careers. These schools now dot the state, and they are always looking for additional industry partners to contribute to the students’ learning experience. A manufacturer could identify which P-TECH schools are nearby and what their areas of focus are, and contact the school to explore a potential partnership. Another initiative targeting the next generation of workers is the Empire State STEM Learning Network. This is a collaborative of educators, business & industry partners, and government leaders in New York working to expand access to high-quality STEM teaching, increase the number of students in STEM disciplines who graduate prepared for 21st century careers, and communicate and advocate for STEM policies and partnerships. The Network, for which SUNY serves as the steward, is made up of 10 regional hubs. Empire State STEM Network leaders are working to provide teachers with industry-led professional development so they have the skills they need to prepare students for future careers in advanced manufacturing, healthcare, computer programming, and other high-need industries. Network leaders also host programming for students including job shadowing, mentoring, applied learning experiences, and apprenticeships. The Empire State STEM Network is a member of the Battelle Institute’s national STEMx Network. Businesses can also take advantage of state programs to offset the costs of training new and existing workers. The Employee Training Incentive Program provides refundable tax credits to New York State employers for procuring skills training or participating in internship programs. And through the annual summer Consolidated Funding Application process, businesses and training providers can apply for Department of State and Department of Labor grants (depending on funding availability) for occupational skills training. Great job New York. It’s inspiring for all manufacturers.